My kids love waffles and I always buy Gardenia Delicia Waffles for them. It comes in a variety of flavours namely Fresh Egg Vanilla, Banana, Orange, Chocolate and Blueberry. However, not all shops or supermarkets sell all flavours. I notice that at 7-11 and Kedai Mesra Petronas, most of the time they carry Fresh Egg Vanilla flavour and occasionally Chocolate. But I can almost always find Blueberry, Orange and Banana flavours at Mynews.com. 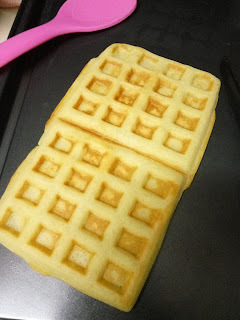 The waffles' sizes are perfect for breakfast-on-the-go and for snacktime but since they eat the waffles a few times a week, I figured that I might as well make my own waffles for them. Recently I won a RM50 Lazada voucher from a contest I joined and since the voucher is expiring on 31 July 2016, I better utilize it. 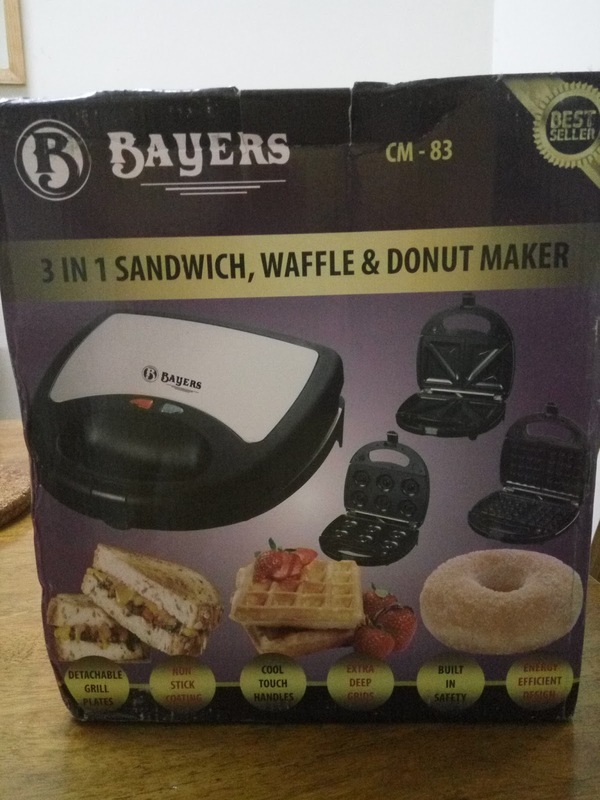 I used the voucher to purchase this Bayers 3 in 1 Sandwich, Waffle & Donut Maker. The sale price when I bought it was RM69.90 but today I checked and it's selling for RM79. The normal price for the item is RM199 so it is still worth it. However, the shipping charges was RM31.80! So expensive but since the voucher is expiring soon, I just went ahead and purchased it. I ordered on Wednesday and the item arrived the very next day. Considering the very expensive shipping charges, I am beyond delighted. Very efficient delivery service, I must say. I was eager to test the item so after dinner that night, I opened the box and took out my shiny new gadget. 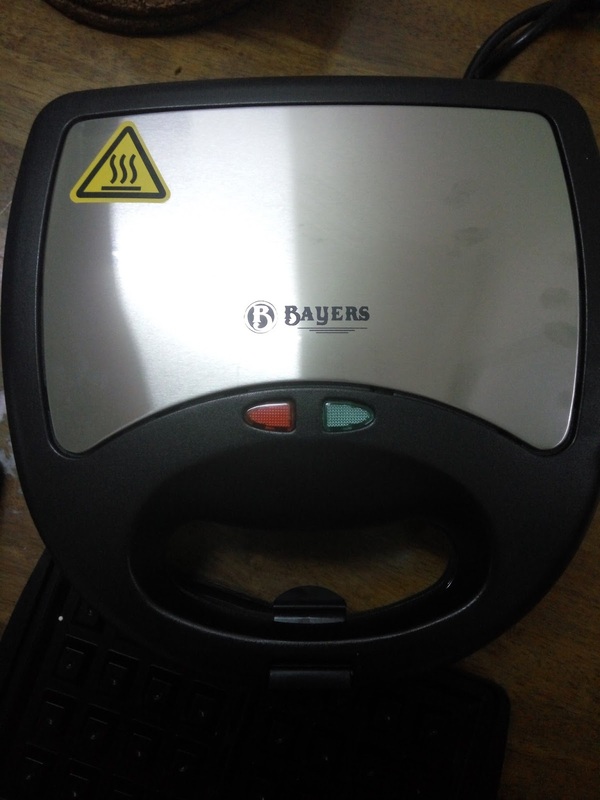 The good thing about this item is that not only it has multiple functions but the plates are interchangeable which makes cleaning them a breeze. You can detach the plates after using and simply wash them clean. Make sure you read the User's Manual for instructions and care. Of course I had to go on Pinterest to search for a waffle recipe and this recipe caught my eyes simply because the name of the recipe is The Greatest Waffle Recipe Ever. 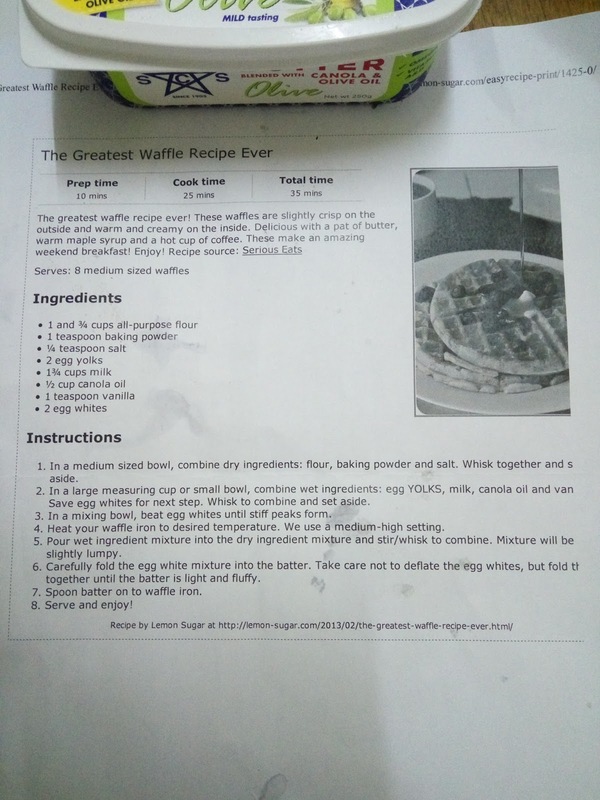 The recipe is a bit tedious especially the part where you have to separate the eggs and beat the egg whites separately but trust me that this step is crucial as this is what makes the waffles fluffy and light, as per the recipe. 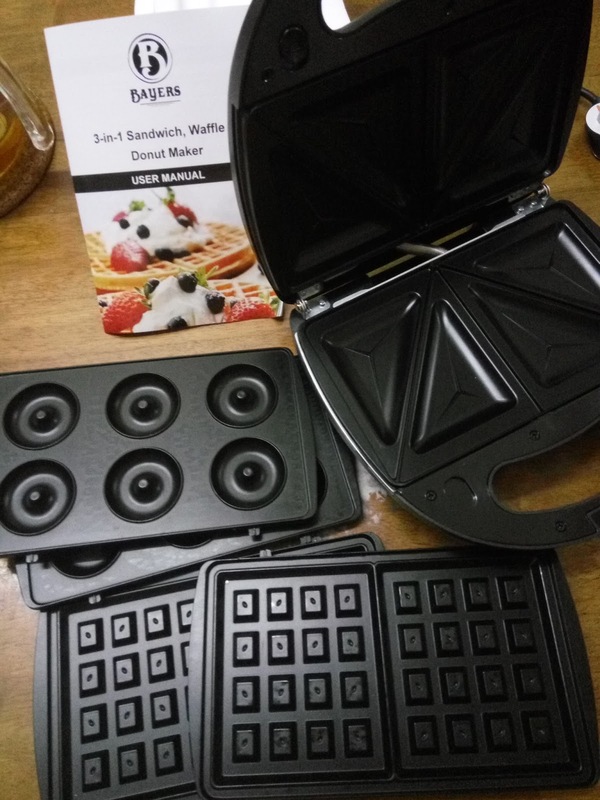 Of course there are tons other waffles recipe so it is up to you to do a trial and error and see which recipe suits you best. The good thing about making your own waffles from scratch is that you know exactly what the ingredients are and there are absolutely zero preservatives so I won't mind my kids eating them every other day, if not everyday. 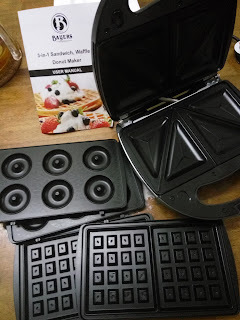 After you have prepared the batter, it is time to make the waffles! Make sure you wipe the plates dry before attaching it to the maker. I brushed some butter onto the plates and started pouring the batter when the waffle maker was hot. The manual said not to open the waffle maker within the first 1 1/2 minutes so I waited for a while. There are two lights, red and green and the lights will keep on turning on and off for the thermostat to adjust (just like how an iron works). Take note that when the green light is off, it doesn't mean that the waffle is ready. I did not bother to set and check the time though but after a few minutes, I opened the waffle maker to find that the top part is hardly brown, let alone cooked. 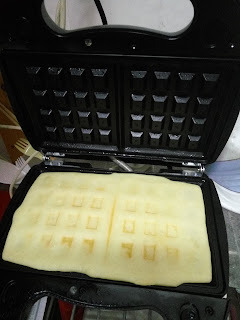 I closed the waffle maker again and waited for a few more minutes. Let's just say that the cooking time is much longer than I expected. I don't think waffles should take that long to cook! If I were to open a waffle kiosk, I would be losing customers LOL. OK yes the waffle maker works and it is not faulty but even though I am not the most patient person I know, waffles shouldn't take forever to cook. The plates didn't even sizzle when I poured the batter. What do you think? 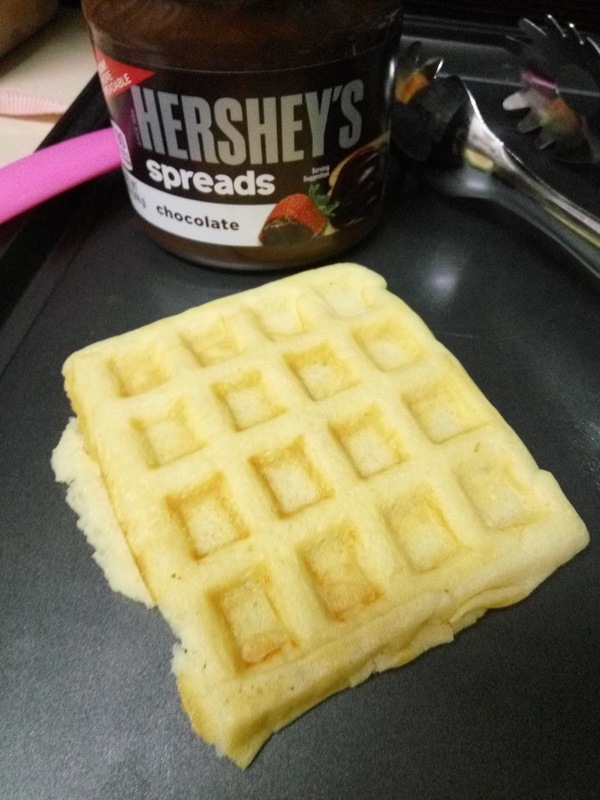 The top part of the waffles hardly brown so I even had to flip the waffle to make sure the top part cooks. That too, takes forever. Again, do take note that I did not time the cooking time but I can bet with you it takes more than 5 minutes. With that batter, I managed to make 5 pieces (x2) waffles. We ate one piece that night, right after cooking. We slathered it with Hershey's chocolate spread and the kids love love love it. The waffle itself isn't sweet if you eat it plain but waffles are meant to be eaten with toppings, right? I froze 3 pieces in a ziplock bag and one piece was for the kids' breakfast the next day. For the ones in the freezer, next time I will just thaw them and either warm them in the microwave or bake them in the oven to brown them evenly. I have yet to use the donut and the sandwich plates but overall I am OK with the item. I won't say I am very happy with it but it works and maybe next time I will try with a different recipe. Who knows it may make a difference. With the price I paid, overall I rated this item as 3.5/5.